All the attendees at the reunion thank the organizing committee for their efforts in planning and organizing the successful 50th reunion of the LHS Class of 1952. We had a great time because of your efforts. The people responsible for planning and organizing the affair Marilynne (Schick) Sikora, Julia (Schrecengost) Mrvan, Jim Goglio, Violet (Shaner) Stivason, and Evelyn (Nulph) McGuire. 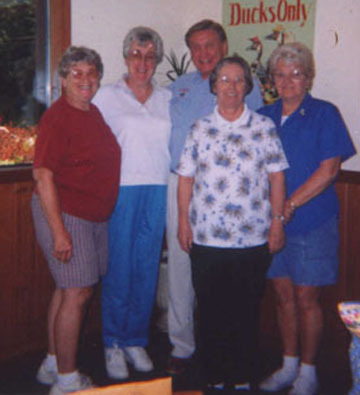 This was taken at the Bonfire restaurant. 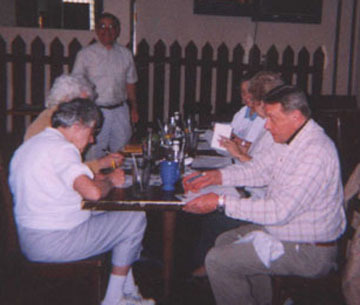 Committee working very hard before eating lunch at the Magpie Restaurant in Leechburg. 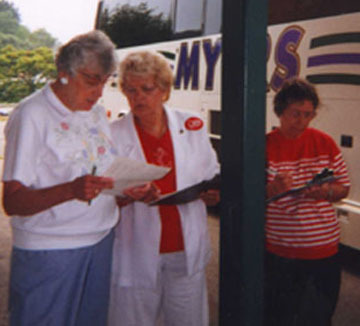 Julia, Evelyn, and Violet checking the list of attendees boarding the bus for the cruise.